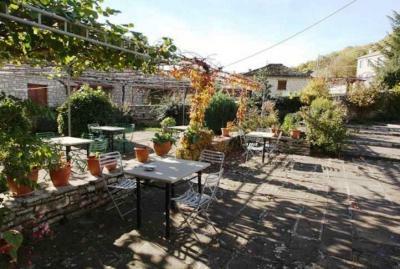 Lock in a great price for Astraka Guesthouse I – rated 9.1 by recent guests! Great stay and loved the area and all there is to do. Great family and enjoyed eatingat the son's wonderful restaurant Definitely worth a visit. Cute place, near to be inside what seemed to be a traditional style home. Historic old house, very friendly manager and nice breakfast. Cosy room. 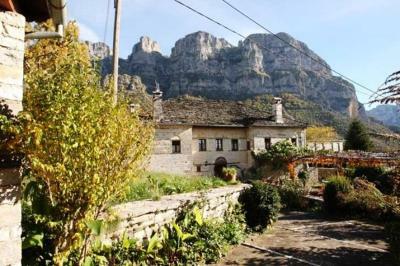 Very nice family run hotel located in the beautiful little village of Papigo in an amazing mountain area with many different hiking routes. We had a beautiful, comfortable rustic room with a lot of wood and a fireplace. The breakfast was good as well. We had a really good time. The host and his wife are very nice, welcoming and helpful people, apart from English he speaks almost native German and gave us a lot of good advice on hiking routes etc and for a little extra money he transported our luggage to the hotel so that we could hike through Vikos canyon without heavy luggage and took us back to Ioannina after our stay. The family's little restaurant is also very good. I can highly recomment this place to everyone who likes hiking, nature, mountains and travelling a bit off the very touristic areas. The best thing about property is its location and it’s owners.i absolutely had one of the best experience. Very nice room in a beautiful stone house, traditionally decorated. Staff very kind, friendly and helpful. Breakfast very good. Really nice location, beautiful village, fantastic natural environment. Location and view are excellent. 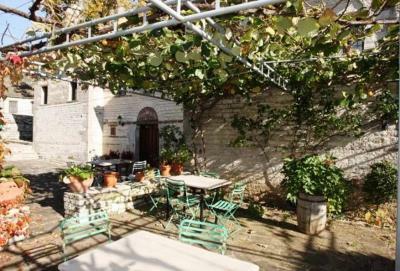 The property is an old authentic greek house. Private parking. It is very close to hiking routs. Large comfortable room and bathroom with traditional furniture in a beautiful stone house. Good breakfast. Little village of Makro Papingo is charming and peaceful. 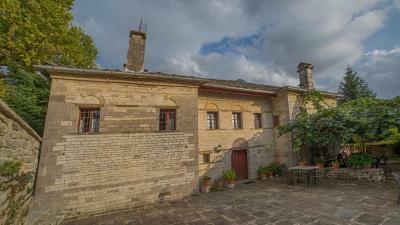 Family-run Guest house Astraka is a 19th-century, stone building in the scenic Papigo village. 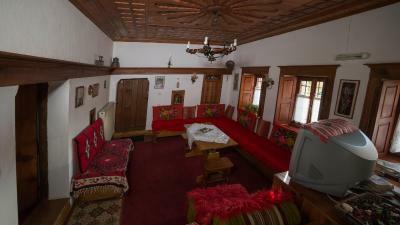 It offers traditionally decorated rooms with a decorative fireplace and views to Mount Astraka. Free Wi-Fi is available in all areas. Featuring traditional furnishings, local fabrics and rugs and wooden ceilings, rooms at the Astraka Guest house I have a TV. Each includes a private bathroom with toiletries. Breakfast is served in the dining room with the big fireplace. The owners also run a tavern serving local recipes such as pies and soups within 350 feet from the property. The village square with old mansions, taverns and shops is within a 5-minute walk. 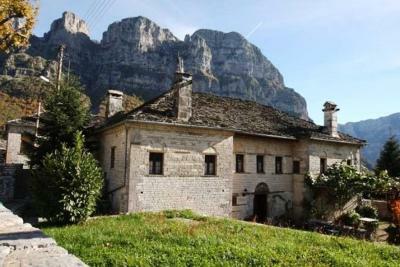 The scenic village of Aristi is 6.8 mi away and Ioannina with the famous Lake Pamvotis is at 37 mi. 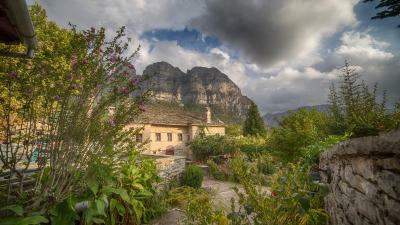 Staff at the tour desk can arrange car rental and offer information on excursions to Vikos Gorge. When would you like to stay at Astraka Guesthouse I? Features traditional furnishings, wooden ceilings and a decorative fireplace. Offers views to Mount Astraka. Includes a TV and private bathroom with toiletries. Free Wi-Fi is available. House Rules Astraka Guesthouse I takes special requests – add in the next step! Astraka Guesthouse I accepts these cards and reserves the right to temporarily hold an amount prior to arrival. Please note that guests must let Astraka Guest house I know in advance of any extra bed requests. The hotelier will then confirm availability. Kindly note that heating is provided upon charge from 1 May until October 15. Ambiance of the building, helpful staff. The place is most cousy, clean in great location. The host were lovely and very friendly. They helped us plan the next days of the trip in the mountains and knew everything there is to know about the area. We got a very nice room with a fireplace (!) and the mountain view from the porch outside of the room was breathtaking. The village of Pápigko is quiet but very authentic and interesting. The hosts were very hospitable and nice. The breakfast left nothing to our imagination! This was not a bad place to stay at all and we'd consider staying there again, but here are some of the less than perfect parts: WiFi only in the breakfast room while we were there (not in our room). WiFi repeater wasn't working properly. No one was at the property itself for check in. There is a sign on the door that says to call a number to check in. If you are traveling without international mobile calling this can be a hassle. There were no check in instructions ahead of time about needing to call or where reception area was located (in a different nearby building). Not much English is spoken there which is fine but was a bit difficult to understand the key instructions for the front door which resulted in a bit of a headache. Breakfast was the most expensive of our trip in Greece and also our least favorite (not bad exactly, just meh especially for the price). I'd consider staying there again but would also check out other options. Nice hosts, good location, good breakfasts, clean.